Though high mileage cars are still rock bottom, there was plenty of evidence today that values of prime sensible mileage stock are starting to rise. Not all traders were prepared for this, which led to some protracted bidding battled today after cars started low only to sell for very solid money. Take the new-shape Volvo V70 in the photo. 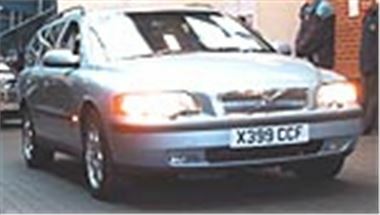 Forgetting T5s it's was the most desirable of all V70s with the Audi 2.5 TDI 5-cylinder engine, it was a 2000X, it had done a very saleable 35,000 miles and it was in a lovely pale metallic blue. Bidding started at a very cheeky £12,000, but soon gathered pace and, after about five minutes hard work, the car finally sold for £16,950. Similarly, a clean, silver 2000W Renault Espace 2.2TD RT short-wheelbase with 45,000 miles started low at £8,000, but went on to reach £12,400. Bidding was stronger for a new-shape Mercedes C180 Avant Garde six-speed manual, which are in short supply from the South African factory. This 17,000 mile eight month old Y reg car started at £19,000 and bid to £20,200 which was deemed not enough even though the new price is only £22,960. A pair of 3.0 V6 S-Type Jags bid to £18,600 for the 2000W automatic with 33,000 miles and £15,300 for the 2000W manual with 22,000 miles and a very badly repainted front nearside wing and valence. It would have been worth the vendor's while to spend money on a proper repair instead of a bodge. Traders who wanted stock simply kept bidding for it. A 56,000 mile BMW 318iS coupe with a/c, I n silver bit with a few scratches, went up in twenty fives to sell for £8,325, and a 49,000 mile 98R 523iSE auto climbed pony by pony to £11.750. But bids stopped short at £30,500 for the same 47,000 mile 99V Merc S320L that bid to £30,900 last week. £7,250 was very fair money for a clean gold 59,000 mile 99T Passat 1.8SE Turbo estate. A 102,000 mile 98S BMW 316i Compact was the cheapest I've seen at £4,725 and £6,350 wasn't dear either for a 118,000 mile 99S Merc C200 Classic. No stunning bargains, then. But unless there's another major terrorist atrocity between now and the new year, prices will almost inevitably rise in January. SEE SEPARATE NEWS ITEM WITH FULL LIST OF ENTRIES FOR BCA CLASSIC CAR SALE on Monday 3rd December.